In the following, we will present up to date statistics on the US and UK market and introduce some emerging markets of the industry: Russia, Brazil and China. Based on data collected by the authorearnings.com, Amazon is the biggest player of the US field. Including indie books (published without ISBN), Amazon accounts for 83% of US ebook purchases – and the rest is almost entirely shared between the Apple iBookStore, Barnes & Noble, Kobo US and the GooglePlay Books. But how big is this US market? The Author Earnings reports that in January 2016 there were around a million paid ebook downloads daily from the Amazon US store only – and if we can believe the trends, this number just grew in the last year. It is also remarkable that while the share of the traditional publishing houses (including the Big 5) falls (probably partly due to the publishers artificially keeping the prices high), the indie market grows: individual authors sell more ebooks daily on Amazon than the publishers with ISBN put together. Indie ebooks (including single author sales) account for around 40% of the total US ebook sales until February 2017. It is interesting to note that last year in the US Kindle Unlimited was only responsible for 12% of the independent authors’ income: while in the US this is almost equivalent with income from all non-Amazon sales channels, the moment you would like to distribute your book outside of US and UK the balance is tilted. 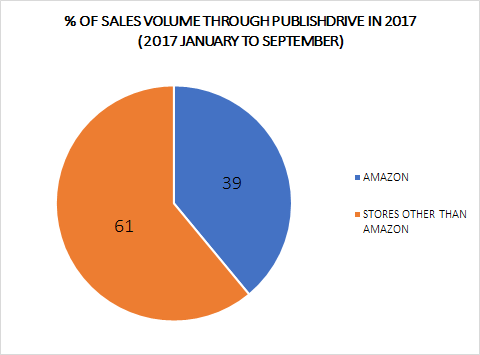 These sales numbers are not so surprising if we take into account that Amazon lets the publishers set the prices; the customers are drawn to the lower prices provided by indie publishers. There is little data about indie sales outside of Amazon in the US: as most online shops provide flexibility and the possibility to revisit one’s business decisions every quarter, many authors decide to sell some of their books exclusively on Amazon, and the rest everywhere else – and change the platform as often as every three months. As we said it in our article about pricing strategies: there is no one size fits all solution. 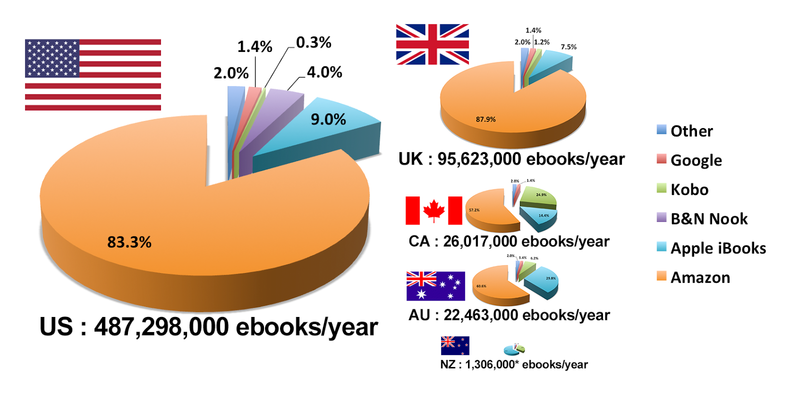 Being the second largest ebook market (accounting for 15% of all English language ebook sales worldwide in 2017), the situation in the UK is just as interesting as in the US. Ebooks account for 34% of all book sales, and the biggest player, unsurprisingly, is Amazon.co.uk: 87.9% of the sales goes through there.. The only unfortunate point being the 20% VAT applied to ebooks in the UK (which is not applied on print): last year people spent an astonishing 405 million USD on ebooks, 82.8% of it on Amazon. The Global Ebook Report points out that in 2013, every fourth book bought in the UK was an ebook; a growing tendency which is even more striking if we only consider adult fiction: 40% of the book purchases were digital. The UK bookmarket also works for export, targeting not only the scandinavian countries, Germany and Ireland, but also SouthEast Asia and China. 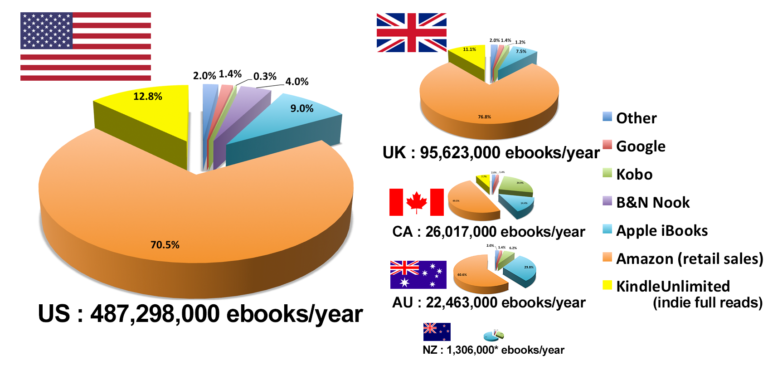 While still big players of the English language market, Canada, Australia and New Zealand are nowhere close to the US or the UK when it comes to ebook sales. New Zealand, however, does not have a country specific Amazon store: its sales are added to the US numbers. Looking at the Canadian and Australian markets, Amazon’s market share is already shrinking compared to the US and UK: only 57.2% in Canada and 60.6% in Australia. Not surprisingly, Rakuten Kobo has almost 25% of the Canadian market, with 14.4% going to Apple iBooks. There is nothing wrong with positioning for the US market, thus being the biggest. However, you are making a mistake if not considering the other large and emerging markets. According to the Global Ebook Report, in 2014 the US had the largest publishing market of the world, by 26%; followed by China (12%) and Germany (8%). The top 6 by value also includes Japan, France and the UK; the rest of the world has a share of 39%. (Note that this percentages include print as well.) Which is a pretty impressive number: who would want to miss out on over 40% of the potential sales? Since the economical crises has made an imprint on most of the book markets in Europe, most countries have only started a transition towards ebooks in the last couple of years. In the following, we will talk about ebook sales in Russia, Brazil and China, based on the findings laid out in the Global Ebook Report. 70% of Russian readers read ebooks – and 92% of these readers admit to getting their books “from the internet”, for free. The Russian book market has seen a couple of troublesome years recently with sales decreasing and big publishing chains closing down. However, reading is still really popular and writers and intellectuals occupy a prominent public role – points out the Global Ebook Report. As online piracy in Russia is still legal (with some considering piracy a noble fight for freedom of information and data), and the country’s pure size makes distributing and acquiring printed books difficult, ebook industry is blooming. This has been noticed by all the big players, who have been present in Russia since 2012: Apple, Google and the British WHSmith. But as the Russian gadgets seem to be more popular than any of the big player’s readers, the retailers have to sell their books in open, easily convertible formats. As all big retailers (Amazon, Apple, Google) are present in Brazil, we can have a fairly reliable picture of tendencies in the largest Latin American market. The interesting part is that based on data collected in 2013, Amazon and Apple are head to head in the number one position, each owning 30% of the market. When in 2014 the Brazilian government decided to digitally distribute textbooks to public school teachers and students (and buying over 400.000 tablets to go with it! ), Amazon became one of the approved platforms of the distribution – alongside the local Saraiva. In terms of academic content, the CAPES federal organization purchased periodical licences and ebooks worth of US $71 million which content is available for university students free of charge. This resulted in an increased interest in the Brazilian market from the big names of the STM sector: Wiley and Springer. As the country with the largest population, in 2013 China has overtaken America to become the world’s biggest e-commerce market (according to Morgan Stanley). After Amazon’s 2013 launch in the country, the most popular platforms for ebook purchases are China Mobile and China Unicom, followed by Amazon and 360. The potential publisher has to consider fix prices for ebooks and CEB, a domestic Chinese ebook format. In terms of reading platforms, mobile devices enjoy almost exclusive preference (China being the world’s biggest market for smartphones), with a high percentage of readers reading fiction through apps. In terms of content, the market is being ruled by Shanda Literature: this is a platform for amateur writers who use it to build a community of readers. The most successful writers get the possibility to turn their works into printed books, using a revenue-sharing agreement with Shonda Literature. 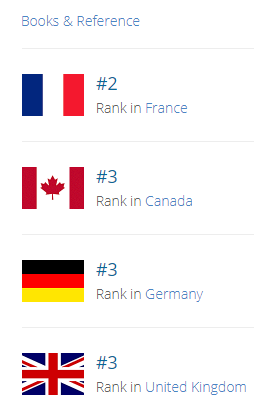 If you are interested in any other countries and want us to find out more about them, or have some exciting data you would like to share with us, please do not hesitate to leave us a comment and we will do our best to answer it. One of the reasons behind Amazon’s traditionally high market share could be that the now 10-year-old Kindle was the first widely available and affordable ebook reader with easy click-to-buy options. Who wants to go through countless converting and transferring processes if you can just buy straight from withing the app and enjoy synchronization across all of your devices? Great as it sounds, however, ebook readers are a dying breed. 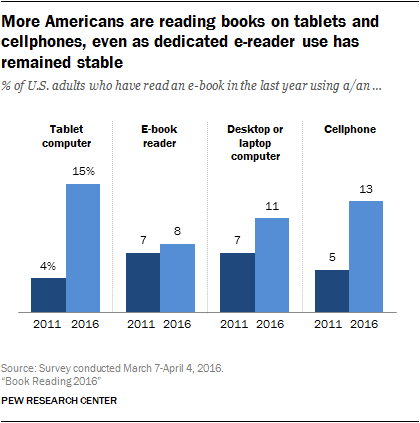 In the US, the number of readers using a dedicated ebook reader has remained the same from 2011 to 2016, while of those reading on tablets, smartphones or laptop substantially grew. More and more users reading from an Apple or Android products are less likely to download Amazon Kindle than to shop from their own pre-installed shops. This claim is supported by SimilarWeb data: according to the charts, Amazon Kindle is only the 2nd or 3rd most popular reading app in Google Play. Synchronisation is no longer an issue with any of the built in apps, neither unique features. The only problem could be catalogue size: while none of the big players disclose their catalogue size, we are talking about millions of books available to buy or rent from Kindle, Google Play or iBooks. The numbers do not lie, so we believe in global publishing to all possible channels in a more transparent way. Amazon ebook market is very much important for all authors and indie publishers but do not forget that you may increase your sales by more than 100%. Just open your mind to new retailers in PublishDrive with a simple click. If you are interested check our FAQ, or shoot an email to support@publishdrive.com, we are happy to chat with you!